How far would you go to make a difference in the future of the planet? Rob Greenfield’s journey is a bit of an extreme one, but his example offers plenty of food for thought for the rest of us. 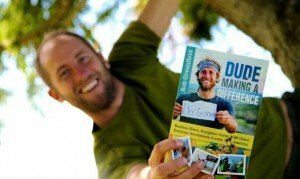 Greenfield’s Dude Making a Difference: Bamboo Bikes, Dumpster Dives and Other Extreme Adventures Across America book isn’t a how-to book for greening up our lives or the planet. Which is probably a good thing, as there seems to be no shortage of advice from both online and print publishers focused on that, so another one might just get lost in the mix. Instead, Greenfield offers us a unique perspective on personal sustainability as experienced during his 4,700 mile bicycle journey across the United States, and along the way, he delivers insights about water use and food waste, clean energy and green transportation, and a host of other issues, all presented as a fun and funky travelogue. ← Can a speech therapist help my toddler?